Despite being one of Hawaii’s most iconic beaches, many visitors don’t know Waikiki Beach is actually an engineered beach that has been filled with imported sand for decades. Waikiki has been facing erosion problems for years, and Hawaii lawmakers are pushing a bill to restore it. The earliest beach replenishment projects date back to the 1920s, but the first major recorded project was in 1939. The state estimates that approximately 300,000 cubic yards of sand have been imported to Waikiki beaches over the past 75 years, often mined from other beaches in the state. Over the past several months severe erosion has caused a concrete slab near the water’s edge at Kuhio Beach to become exposed. 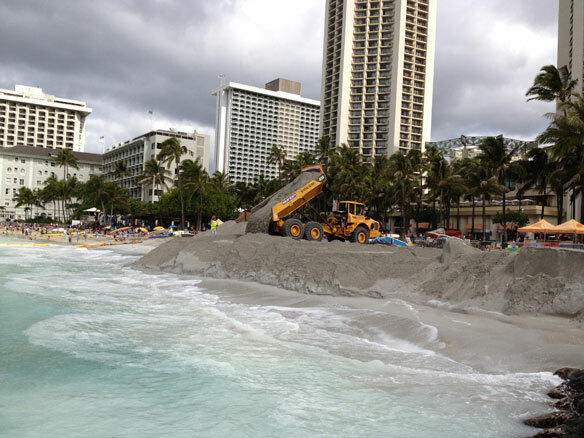 Beach erosion in Waikiki has been a problem for decades and has resulted in at least 10 sand replenishment projects since 1939. 300,000 cubic yards of sand has been placed onto Waikiki Beach over the past 77 years. Sea-level rise is a significant factor in the major shoreline change underway in Hawaii, where 52 to 72 percent of beaches on the chain of islands have eroded over the past century. Living on the shores of Hawaii: natural hazards, the environment, and our communities, A book by Chip Fletcher; Robynne Boyd, William J. Neal and Virginia Tice.